Australia  2014  93m   Directed by: Travis Bain.  Starring: Shawn Brack, Anthony Ring, Melanie Serafin, Vernon Wells, Warren Clements, Andy Bramble.  Music by: Richard Band, Amotz Plessner. Two modern-day treasure hunters go searching for the lost gold of a legendary 1800s outlaw in the remote jungles of Far North Queensland, Australia. 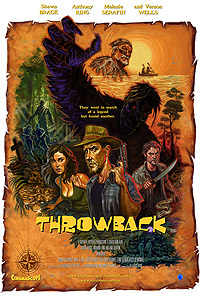 But instead of riches, they find a different kind of legend: a ferocious Australian monster known as a Yowie, Australia's answer to Bigfoot, and a savage battle for survival ensues. Don't let the small cast Throw you Back, this is quite a good film. Which I hope finds a bigger audience through distribution. I was able to watch this with the cast and crew at a special sneak peek showing this past May. And I have to tell everyone I really enjoyed it. The film reminds me of the times when a film could shock and scare you, make you wonder what is going to happen next, while not revealing anything to the viewer until the final act. The pacing of the film is fresh and exciting. Also reminds of those early Universal Monster films as well as most recent Raiders of the Lost Ark. Beautifully shot in Australia, showcases locations never seen on film. Acting is also top notch, especially the bad guy. I know I mention nothing about what the film was about, that for you the viewer to seek out and enjoy for yourselves. So check it out when or as soon as you can. Review by Monkeyvotto from the Internet Movie Database.